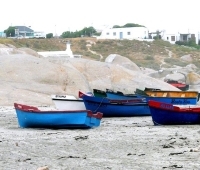 Paternoster, taking its name from the prayers of shipwrecked Portuguese sailors that fell afoul of its rugged coastline, is a quaint fishing village located about 90 minutes' drive from Cape Town. A popular weekend city break destination, Paternoster has slowly but surely built a reputation for itself as the ideal place to go for a beach holiday on the West Coast. The first thing visitors to Paternoster will notice are the rows and rows of white-washed fisherman houses: a lovely, and incredibly photogenic, architectural quirk that will linger long in the memory. A holiday in Paternoster is probably best taken at snail's pace, enjoying long walks on the fine sandy beaches and revelling in the region's significant bird life. For active types, hiking trails, mountain biking, sea kayaking, diving, and spear-fishing excursions are available. The West Coast gets extremely hot but the freezing sea water will certainly cool visitors down! Finally, one of Paternoster's most abiding attractions is the quality and availability of fresh fish and seafood, especially crayfish, in the area, as well as its burgeoning restaurant scene.